de sa forme artistique et de sa maturité en 1968. 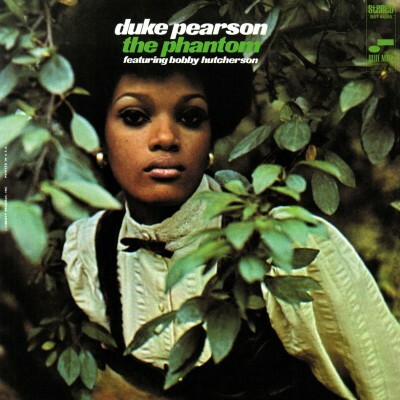 By its vibrant colours and its amazing groove, “The Phantom” is an album which overpasses all the jewels that pianist Duke Pearson has recorded for Blue Note. The group of musicians here present is an extended one, Jerry Dodgion at the flute and the alto, Bobby Hutcherson on vibes, Sam Brown and Al Gafa on guitar, Bob Cranshaw on bass and Carlos “Potato” Valdes Valdez on percussions. An extended band, not a big band as often with Duke Pearson, but with the same musical ambition. The energy of this record is resulting from the clarity emerging strangely through complex arrangements and harmonies. This album illustrates more than any other not only Duke’s incisive playing but also his fulgurant musical visions. Duke Pearson is at his top here in 1968 !